We want to see Newcastle become a #city4kids where people raise a family and choose to stay. This means that the council has to start planning and building an inclusive cycle network that support the diverse range of people living in Newcastle and cater for the day to day activities citizens routinely get up to. Over a number of upcoming articles we will take a more detailed look at the different elements that make up a well designed inclusive cycling network and show how the council should start planning for these. In this article we provide an overview of the features of an inclusive cycle network that caters for a diversity of different journey types and the people that make them. Since 2011 when Newcastle’s Cycling Strategy was published, Newcastle has defined the need the need for a network of cycle routes. Currently this is identified as a number of Strategic Cycle Routes. 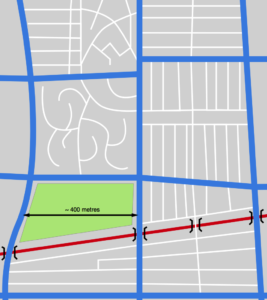 The exact location of these routes has not been formally defined by the council. 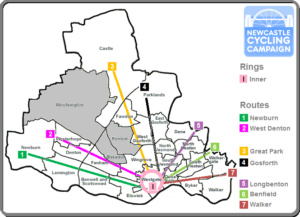 The following image shows roughly where the routes would go, we have overlaid the routes onto a map showing the different areas of Newcastle. The existing focus on the strategic cycle routes focuses mainly on moving people to and from the city centre, and this largely is due to a focus on work commuting trips in transport planning. However commuter trips only make up 1 in 6 of all journeys [https://katsdekker.wordpress.com/2016/07/08/lets-design-for-women-too-beyond-the-commute/]. To enable cycling for everyone, all ages and abilities, planning and engineering must also be inclusive of the other 5 out of 6 journeys that are made. In other words, the council need to start thinking beyond the strategic routes and design and build a cohesive cycle network that supports the diversity of different journey types made by a broader variety of people. What should the cycle network look like? This should create a grid, with areas around 400m by 400m within urban and suburban areas. (In rural areas the network is based more on where people travel to and from, for example routes between villages and towns). The grid should contain high quality provision with enough width to safely allow two people to ride side by side. This width is especially important for family cycling as it allows parents to cycle alongside children who are learning to cycle. Parents can cycle alongside their children and place a protective hand on the child’s back. The type of provision must always be based upon the road type and expected traffic conditions. Between the main cycle network, all streets that have any houses or amenities that somebody may want to cycle to needs basic provision. This will allow all journeys to start and end safely for those cycling. 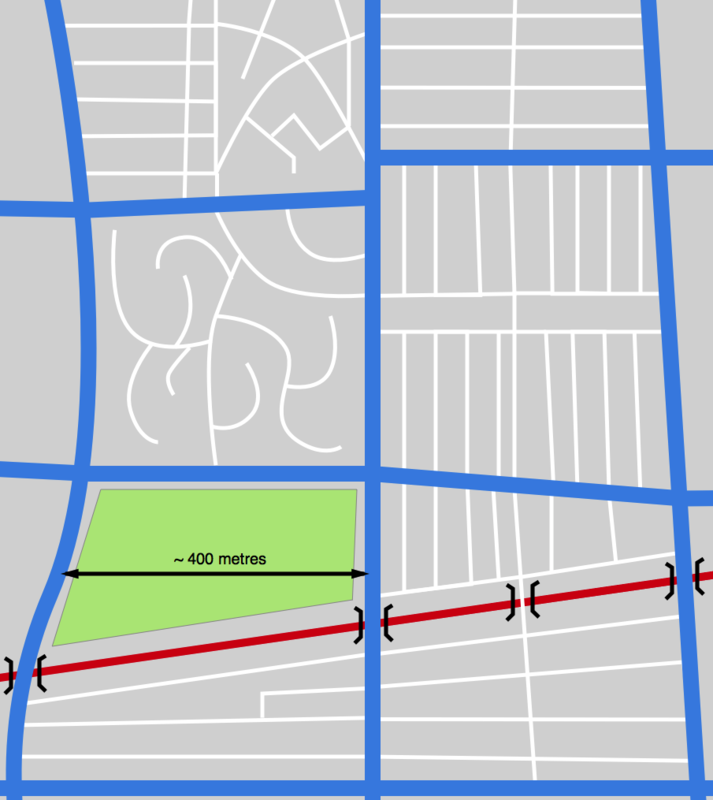 The type of provision for these street must also be based on the road type and expected traffic conditions. These form part of the main cycle network, but are designed for higher numbers of cyclists and faster journeys over longer distances. This is generally done through providing more space for cycling and giving priority and removing any conflict with other modes of transport at junctions along the entire route. In the diagram, the main cycle network is shown in blue, streets which would have basic provision are white and barriers (such as a railway line) are red. In a real world scenario it is unlikely that a straightforward grid can be be made, in a future article we will look at a way in which the main cycle network can be planned. No Cycling Priority Routes have been drawn as these require looking at a much wider area, these will be looked at in more detail in a future article. * In the Design Manual for Bicycle Traffic, Cycling Priority Routes are referred to as Cycle Highways, we have chosen a name that we feel represents their function and avoids confusion with London’s Cycle Superhighways.